We started with a beet and grapefruit salad that sounded like an interesting combination but basically tasted like beet salad with the grapefruit pickled as well. It also has nuts in it, which is a turn-off for me but not for most people so ignore my personal taste on that. 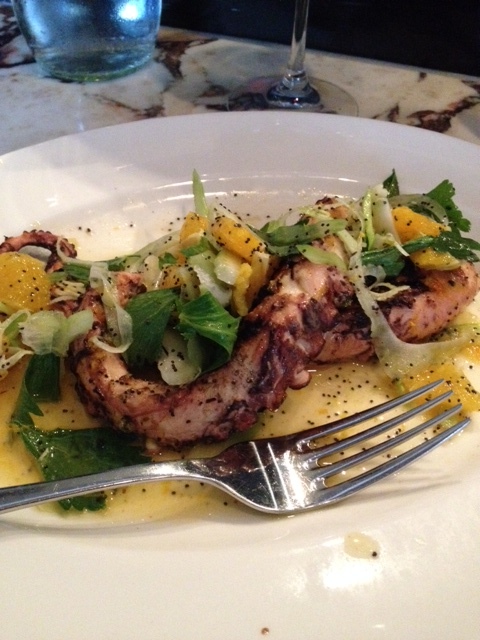 Looking over the entrees, I opted for octopus which I love and which is difficult to do properly. Boltwood nailed the preparation of it, it was a wonderful dish. Luckily too, the waitress mentioned to me it was a smaller offering, only one octopus tentacle basically, so I ordered a double order. AT $18 for a single, a double was not cheap, but everything in it, fennel which i also love, and oranges, was terrific. It was the best octopus I’ve had on this side of the Atlantic, topped only by an offering we had on our trip to southern Italy last year. The octopus at Bolwood was delicious and tender, I could have eaten four orders instead of the two shown here that I ordered. My wife had the chicken, which looked like basic chicken, really nothing surprising there. 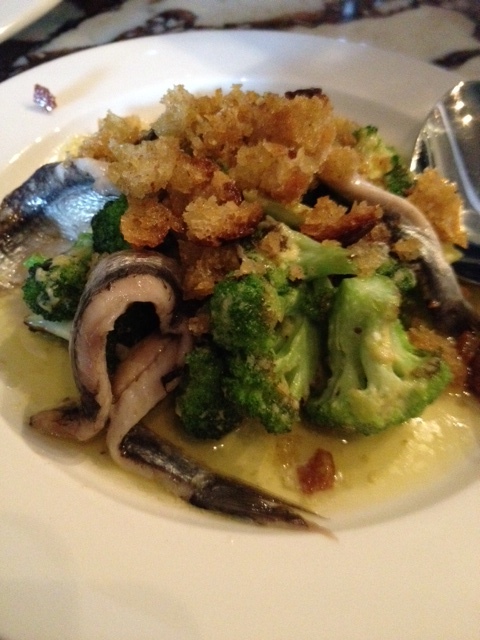 We were surprised,and I thoroughly enjoyed, a side dish of broccoli with white anchovies and breadcrumbs (see photo above). This was a dish where all the tastes blended together wonderfully to produce an exquisite combination. Yes, anchovies are by nature salty and this one dish likely put me over my daily salt allowance of 1,200 mgs. But if I’m going to go over, this is the sort of dish I will do it for. Boltwood is noisy, a large communal table likely accounts for a great deal of the noise, and bare bones looking. It still looks like LuLu’s which was in the space before it. I’m not sure if that’s by design and redecorating is coming or not. All in all, I enjoyed it but would like to see more. Boltwood features local ingredients (although I doubt my octopus was very local) and so changes its menu with the seasons and availability, so it would be worth keeping an eye on it to see what else it can come up with.